About 2 months ago I walked into Studio Fabrics and bought all the fabric I needed to make my wedding dress. I've kept it hidden in my sewing room all this time although I did bring it out a couple of times just to look at it and imagine the final dress. For those of you who've been following along with this you'll know that I shared some original inspiration, made many muslins, perfected the skirt portion of the dress and got thoroughly overwhelmed on how to embellish the dress. It's been a long journey so far and I haven't even started making the wedding dress for real yet. I really mulled over all the inspiration for how to embellish this dress for a long time. I trawled through all the pictures on my pinterest boards, I read every comment left as advice or encouragement and I talked it over with some people to clear my mind. I've made the decision that this dress doesn't have to look like it fell off pinterest and onto my body. It doesn't have to be sequinned, jewelled or adorned in any way that doesn't feel natural to me. In fact it doesn't have to be embellished at all. I chose fabrics that I love. They may be simple and classic but they're fabrics that I couldn't get out of my head once I walked out of the fabric store. In the end I wrote down three words that had to express what I wanted in this dress. These are the words that I came up with and they made me realise that the simpler the dress the better. I'm going to let my fabrics speak for themselves and I am relieved. This picture is proof that my sewing room is the cleanest it's ever been. I even moved my stash to the shelves right beside my sewing table so that my whole experience sewing in there is inspired by fabric. Nothing else. We've done extensive landscaping and turfing in the backyard to get it ready for the wedding and it calms me to be sewing this dress while overlooking my wedding venue. It allows me to keep everything in perspective. So there's going to be a big long silence on this blog until the October long weekend. Thank goodness I've got my Spoolettes to hang out with and Frocktails to look forward to. It will keep me sane in the middle of the biggest sewing project of my life. Wow. I used to do exactly that with my clients to help them understand what they wanted - choose three words about how they wanted to feel in their dress. It's a goody eh! Yeah I think it's really easy to get too mixed up trying to make the perfect dress when really it's quite simple - those 3 words helped. I also thought the same thing - if I make it and it looks bare I can add some things later but I'm pretty at peace with how it will look. Thank you! It should be a pretty fun couple of months seeing it come together! Can't wait to see it happen! Thanks! It's a pretty great place to hang out. Greatest sewing project indeed - looking forward to it myself. We are here Jodie, along for the journey. If you need help in anyway just Holla girl. 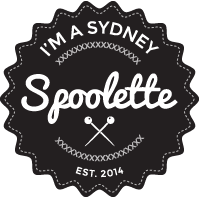 The spoolettes are there. Thanks Steph! I'm glad I've got some local peeps to hang out with during this. Not least so I've got some people I can talk about it technically with. Non sewing people haven't really got a clue what I'm talking about when I start. Thanks Mel! I'm in for a fun couple of months. Luckily I'm pretty zen about the whole thing right now because I've allowed enough time. Let's hope the zen stays with me until the end! Beautiful words to describe your dress! Enjoy the sewing journey! Thank you - it will be one heck of a sewing journey! Yeah I'm not sure it's the kind of fabric store I'm ever likely to buy fabric in again but it was a great experience! I'm hoping all this work makes it easy - fingers crossed! Enjoy every moment, you are prepared and ready and it's all going to be gorgeous. Love that you are going to be you, always so sad to see someone quite clearly playing dress ups and looking uncomfortable all day. Thanks, I still feel pretty prepared with my timing. I trust that what I've got in my head will work out. Thanks for your support! Hope you enjoy the process, I'm sure you will make something amazing! 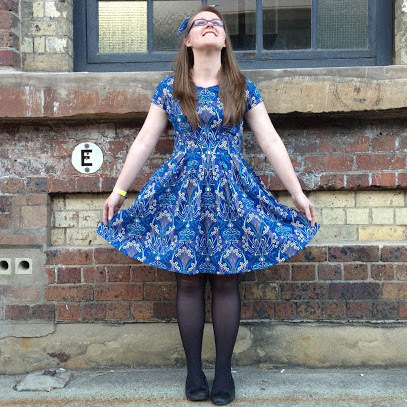 It really is about making a dress that fits your personal style and is right for you. I am SO NOT a sequins and embellished dress kind of gal. If I was getting married I would not be the kind to cover a dress in that kind of thing either.